We are proud to announce the release of our first book in the Xicana Chronicles publishing house series, Rascuacha Tech by Iris Rodriguez. This is officially the first book in the Xicana Chronicles publishing house series! This book was produced 100% in-house y con puras ganas! * Also see Journey of a Rascuacha Tech and the new Digital Resistance 101 course. Thank you to everyone that supported our campaign! Subscribe to stay updated on future releases! Congratulations Xicana Chronicles publishing house for your first published book. 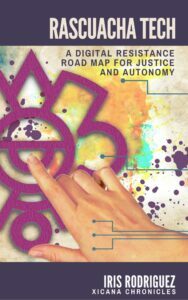 Rascuacha Tech by Iris Rodriguez.looks like a great read! Signup today and be the first to get notified on new updates from Xicana Chronicles and Xica Media networks.